New Orleans native Christian Scott continues to push the boundaries. On his latest release, the trumpet player and bandleader elaborates on his concept of “Stretch” music, a proposed evolution in jazz that aggressively incorporates influences and voices from outside the genre. The critically acclaimed album marks the next step in a career that carries the Upper Ninth Ward native around the globe, but finds him residing again in his hometown. 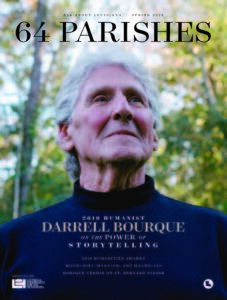 The grandson of legendary Mardi Gras Indian Big Chief Donald Harrison and the nephew of jazz great Donald Harrison, Jr., Scott returns to New Orleans to carry on a family tradition of sustaining culture through artistic example and advocacy. Brian Boyles caught up with Scott at Guardians Institute, a community space established on the lot next to his grandparents’ home on Independence Street. Chris Robert directed the video below. Boyles: I know your mom grew up next door and you spent a lot of time there. As a place to come up and to learn about music, what are some impressions from your early life in this neighborhood? Scott: I think I was very fortunate to grow up in this neighborhood. Every weekend was a secondline, every weekend there was Indian practice. Most of my formative experiences in music happened either in that household or in this neighborhood. I realize now [that] the overwhelming majority of music that I hear–American music–is derivative of the stuff that’s created in this general neighborhood, especially rhythmically. The vast majority that you hear in rhythm and blues–the stuff that evolved into rock music–the core rhythms actually happened here. I was really fortunate to be able to be there. I don’t think I have to point too hard to how influential this space is for jazz music. What’s really interesting to me now is to be able to take a moment to…excavate some of these things from these musical cultures, and [figure out] how they actually evolved out of stuff that was built here. Boyles: I’ve known young kids who’ve grown up in the Mardi Gras Indian culture. There’s a performance quality but also a remove, and a kind of disciplined role they’re expected to play. What are your memories of being in that position, as a family member and as a performer? Scott: Most of my early memories came from my grandfather teaching me how to be a spy boy, the fact that you had to be comfortable taking the walk alone and admit that you could be surrounded by either friendly gangs or not friendly gangs. Whatever the distance you had to go to protect your chief and make sure that your gang was safe, you had to be okay with. This neighborhood has a fighting culture. That aspect of it was very attractive to me because I grew up liking to box. So these are sort of a part of my makeup as a child. I know that when I hear those rhythms, what’s being said is in a language that is my language. It’s not a language that was disseminated to me by someone else. You can see sort of an ancestral recall when one is going about that. When you don the feathers and put the suit on, it’s also the tenants of the culture. You know that. You have to be willing to walk the full distance that you’re going to put the suit on. Those types of things bring forth a very different aspect of your humanity than you generally experience when you’re just walking around the street in jeans and a t-shirt. I used to love having conversations with papa about what it took to be a spy boy, and how that was how he started and ending up being the chief, and conjecturing as to what my reality might be like as a man doing it at some point. But as I get older and I think more on it, I really fell in love with music through this culture. When I hear the rhythms like the running rhythm, when I hear these drums, I react in a way that I do not react to other music. I know that when I hear those rhythms, what’s being said is in a language that is my language. It’s not a language that was disseminated to me by someone else. It’s something that at its core is fundamentally mine and that resonates with me. Boyles: It’s very interesting that you put it that way because it seems like your musical direction is also concerned with taking chances. You seem to be comfortable and brave in creating your own language, and in creating new forms musically. Can you talk about the “whisper” technique? Scott: Yeah, sure. The whisper technique is a warm air technique. There’s a couple of things that have to happen for you to be able to do it. It’s a technique that took me years to develop and now there are finally some younger guys that are finally starting to develop. As I understand it for the modern players I’m the only guy that does it. Clark Terry told me that Clifford Brown also used to use it but the recording technique at the time was so bad that you couldn’t actually hear it. The technique is basically, you’re using warm air and you’re prioritizing breath at the mouthpiece of vibration. The warmer air actually rubs the inner-workings of the brass a little bit different, which gives more of a hazy sound. You have to learn to refine warming the air up in your diaphragm and feigning phrases from your chest air, or frogging. To be able to get certain phrases out while the core air is warming up. Boyles: What appeals to you about that sound that it generates? Scott: Well in terms of it’s communicative value, I think if we’re having a conversations right now and I just raise my voice at you, you would probably recoil or you would get angry. So I think that the trumpet in terms of it’s most natural sound in this context, in [the] New Orleanian music context, is generally screaming at people. So it’s loud, brash, has a considerable amount of bravado. I’ve learned that sometimes if you want people to listen harder, sometimes you have to lower your voice and whisper a little bit because it makes your senses do something different than if I’m raising my voice. Boyles: The points you’re trying to make with this music seem to be the type that might cause some people to raise their voices to deliver. I thought this was an interesting quote. “Jazz as a definition separates, excludes, and misses out on being open and free to grow. In my opinion it’s freedom that actually defines jazz and has given new life to the form.” Do you think that there’s been receding from that freedom in recent years, or more of an emphasis on classicism? Scott: Definitely in the last quarter-century, [there’s been] an emphasis on classicism. If we’re being honest–I’m going to speak candidly about jazz music specifically–it actually happens to be one of the most closed cultures right now, musically, on the planet. Which is also part of the reason that it’s having such a difficult time with artists having commercial success because of the types of pejorative and belittling ideas that the practitioners have about other cultures of music. For me, Stretch Music is as much a philosophy as it is a stance in music. In order to stretch music you have to be able to stretch yourself. I don’t think that because someone was born in Sweden with blonde hair and blue eyes it makes them ineligible to be a jazz musician. There are people that think that. To me the idea of genre is the same. It’s just an extension of that type of self-segregating and kind of linear thinking that, on a general level, is designed so that people can funnel money in one direction of another. We can make an argument for that with race as well. I don’t want my children to inherit a reality where they are going to be brow-beaten with these really linear ideas about how they should treat people and see people. The medium that I’ve chosen to express myself is sound art. So the best way for me to go about the business of eradicating the tenants of an argument that I think is pejorative, belittling, antiquated and archaic is to actually break it down with sound art. So that’s what Stretch Music is. Boyles: Unpacking that concept, it seems that classicism emerged from a belief that new artists were skipping over the basics or not knowing the masters. It also generated a lot of record sales for certain people as well, too. In your approach to Stretch Music, are there fundamental understandings about jazz as the tradition that need to be in place before one can “stretch”? Scott: That’s interesting you put it that way. I’ve never been asked that question but I love the question. I think, on a general level, it is a healthy assumption to say that this generation of stretch musicians, at their core, are jazz musicians. The way that they’re stepping into the music comes from a creative improvised context. For me as a conceptualist, I think it is just as attractive to find someone that understands all the tenants of Trap music, and for them to actually be involved in this culture as well. I think it’s important that they have a firm understanding of jazz if that’s the landscape that they are entering into this culture of music through. But I don’t think that the tenants of jazz have more weight than any other culture of music. That would defeat the point because it still ends up being the same argument. Boyles: I wanted to look at a couple of songs off the album. Can you talk about “Twin”? Scott: Absolutely. “Twin” is a song that I wrote for my identical twin brother Kiel. His name is Kiel Adrian Scott. He’s a film director working with Spike Lee for a number of years and has just finished up an incredible short film called Samaria. The preceding one, The Raw Effect won a myriad of awards. I think he’s more hardworking and more talented and more intelligent! He’s like my beacon of lights. I’m always trying to catch up to him. Even though he was born second, I’ve always sort of looked at him like the older brother but I always tell him I’m the elder. For years, there are multiple songs that have his name, actually. This one was really more about…a conversation. We were talking about what it actually took for us to be here. We started to conjecture about what the experiences in West Africa may have been like and what the experience in Virginia and the experience in Louisiana may have been like. Later on that night after we were done the conversation I started to think about ways to depict rhythmically our ancestry. So when you hear the rhythms on “Twins,” it’s sort of my attempt to collapse rhythms from Senegal and Gambia and Mali, Benin, to dealing with the rhythms that are in the Latin Caribbean and Havana, to dealing with the Afro-Native American rhythms in New Orleans, to create a palate that is a mixture of all of those cultures. If I can give a visual representation of it: the two trumpets are the two twins. So they start of as one egg and then they split. Then they’re sort of in tandem together but sometimes there are little fractures and one goes off in one area and one goes off in another. But then they ultimately end up making their way back. Then they’re in harmony. Boyles: The other one I had was “West to the West” because I thought that this might be a good one. We’re talking about stretch music. That blues hook on it reminded me of [the Jimi Hendrix-led] Band of Gypsies. Scott: Sure. It’s funny because the mantra in the song is based off of a traditional blues phrase. I’ve heard Lighting Hopkins play it but more notably when Jimi Hendrix played “Born Under a Bad Sign” this is that phrase. I wanted to try and take something that was at its core blues, but rock as it is an extension of blues, to sort of move that into another realm. So we took the phrase and we took it out of four and put it into seven to add more layers to it if you will. It’s funny because that song is about how much I hate Los Angeles and as a concept it grew into all of these things but it was really me just kind of expressing a certain type of angst that I had from living on Sunset Boulevard for a year and seeing what that was all about and really not digging it. Boyles: How are you finding the younger musicians that want to go in this direction? Scott: I think it depends on the weather. What’s great about working with younger musicians is they haven’t developed a healthy hate of other cultures of music. They’re still willing to experiment which is great. The thing is, having a young band presents it’s own issues that you have to deal with. Maturity issues you have to deal with. Them learning how to become world citizens and making sure that they’re taking care of themselves and not putting themselves in compromising positions with people. You also have to worry about other people that are around them trying to misuse them and to sort of use their guile to procure resources from them. So it can be difficult…. I started playing when I was 11 but was basically starting to gig when I was 13. So I was learning from Doc Cheatum and Danny Barker. The guys that were the architects of this music, really. One thing that I think differentiates them from the younger vanguard is the amount of attention to detail that they and how much they loved playing and how much time they were willing to put in. Whereas the younger generation doesn’t really seem to be that interested in actually work-shopping music as they are interested in just expressing what it is that they have to say. Which is fine, it’s just a cultural difference. For me, I’m having a hard walk navigating that just because I really like to play and I’m playing the instrument that makes you bleed. You see what I’m saying? So it’s like “if I want to play all night long then why don’t you?” So going through that is … A lot of the musicians are saying that I’m kind of turning into like the Art Blakey or Miles Davis-ey thing where I’m bringing up all the younger musicians. From reading up on their experience I know that they went through a lot with younger musicians so I realized I had to take that walk too. Boyles: What do you remember about Danny Barker? Scott: First off, I remember Miss Lu Lu’s yum-yum. She would make this bread pudding that was incredible. I used to go by him before I played trumpet, though. Before I even played the instruments my Aunt Cherise or my mother, my grandmother. They would bring my cousin Brian and my twin brother Kiel and I over there. We would just hang out and listen to music and they would tell stories and eat and have a good time. So it was really more like an extension of my family than just a musical thing. Boyles: The role that he played, it seems like it ended up having three decades of influence afterwards. He came back home after being gone for a long time. You’ve decided to come back and really make this your home base. What drove that decision? Scott: I’ve realized that I was the beneficiary of a lot of wisdom from older males. And females. But I think in terms of this specific culture it’s really important for the young boys to see positive males in their space that are also not afraid to challenge and deal with the ones that may be up to unlordable behavior. That means police officers. That means guys in the neighborhood that might be up to selling drugs or whatever as examples. So I realized that it was my turn. That I could stay away and just do the jazz thing like a myriad of great musicians from New Orleans who decided not to come back. But my uncle came back and I wouldn’t be who I am if he hadn’t come back. Scott: Well on a lot of levels. 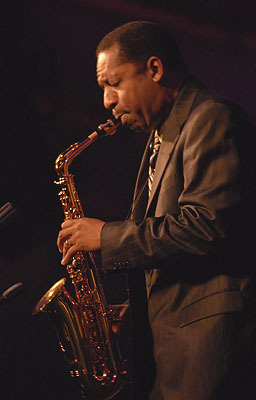 You can make a healthy argument that he’s the baddest alto-saxophonist to ever touch the instrument. I am an expert and I could make that argument and all the other experts would make that argument. So to be fortunate enough to be a pupil and an apprentice to someone that has that type of refinement and prowess and also is very good at articulating the things that helped him develop–that of course is going to change you. The types of things that he showed us how to refine are different. It’s not just to play a bebop scale over this like. No, this guy can teach you how to create the most visceral reaction of the human animal through vibration through the bell of a trumpet. This is a guy that can make you throw up your stomach with vibration. That type of power and that type of refinement. So there’s that and then also I think in terms of when my grandfather died. Donald sort of stepped into the fold and replacing him on a lot of levels. Which makes sense because he’s his son. But for all of the boys in my generation to also have this guy to look up to that is a serious, powerful guy that is incredibly intelligent that doesn’t really take part in unlordable behavior. This is a guy that doesn’t really drink. He definitely doesn’t do any drugs. So to see that as a young person you say “wow, this guy really has it together.” And if I’m being honest all these really beautiful women think he’s handsome and he drives really nice cars. You know, I wasn’t going to be influenced by the knuckleheads in my neighborhoods because the best version of a male that I could find was basically around and in my household, or I was in his household. All of the positive tenants that [you] want to develop about manhood, he exhibited all of those qualities. So he was a heavy influence on me. Boyles: What do you want to see happen here at Guardians Institute? Scott: Man, I want to see a lot happen here, but a lot is happening here. I think what would be great is to sort of expand. Start building more classrooms so we can start building on a more personal, private instruction. In terms of whether or not you’re talking about music or fiscal literacy or West African rhythmic retention. Culinary art. I think that this area has a lot to offer. This community has a lot to offer. There are people in this community that have a lot to offer but don’t necessarily have spaces to offer it in. So when my family decided to actually do this I got really giddy and really excited because I remember growing up in this neighborhood and unless you went to Bunny Friend Park there wasn’t really an are where you could be where you felt like you were safe and you knew that when you walked in that you were welcome. This is that for this neighborhood right now but it’s an incredible work and we do our best. We need more space. I’d like to see generation after generation after generation of positive and balanced young people being able to come here and refine themselves in whatever manner they chose to do so and to know that they are welcome to matter what culture or what class or what sect or what cult they come from. Big Chief Juan Pardo & Golden Comanche’s, Spirit Food I think his rhythms are incredible and he sounds sort of like the old Indians. The Weeknd The young girls seem to love it, so I’m trying to figure out what they love so much about it. They love it. So I’ve been listening to that a lot like “The Hills” and “Often” and all these things to try to figure out what it is about it that is so attractive. [When I was younger] I was a Clifford Brown, Dizzy Gilespie guy and I thought that Miles played too few notes. I didn’t get it yet. I went about the business of listening to “Kind of Blue” and “Round About Midnight” because my uncle had told me, and I immediately fell in love with not just his playing, but also the environments that he created, and immediately wanted to find a place for myself in it. The problem was that Miles was already on the record. So the thought that really sort of the impetus for what ended up becoming the [Stretch Music] app was really me trying to get Miles Davis the hell out of the way. The app, for this culture of music, is the first interactive record or interactive CD. It’s really an interactive media player, if you will. It gives you the ability to isolate, mute, any of the voices that we recorded. You can mute them, solo them, pan them from left to right. You can use the fader and sort of create your own mix. You can slow it down, speed it up, and loop it. Click here to download the Stretch Music app.